Study: Vin Scully harbors no bias. According to a study in the Wall Street Journal, five out of 30 Major League Baseball broadcasters (or broadcasting teams) are unbiased. Vin Scully is one. It didn’t take long for the study to confirm what many baseball observers have long expected. During the White Sox game–a 2-1 win against the Texas Rangers–Harrelson and Stone (but mostly Harrelson) made a whopping 104 biased statements. 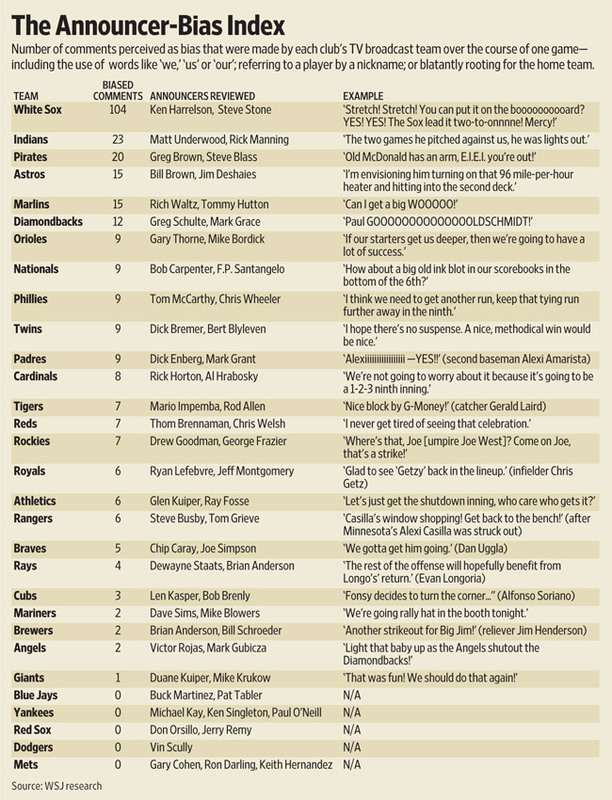 To put that in perspective, the Cleveland Indians duo of Matt Underwood and Rick Manning ranked second with just 23 biased comments and 24 of the 30 teams had fewer than 10. This entry was posted in In the media and tagged Vin Scully by J.P. Hoornstra. Bookmark the permalink.